A Book of Hours from the late 1470s. The Books of Hours (Latin: Horae; English: Primer) represented a class of devotional manuals popular among medieval Catholic laity. Though their contents were relatively variable, each Book typically contained a detailed Calendar of Saints, a series of Marian devotions (modeled on the Canonical Hours followed by monastic orders), and a catalog of other prayers. These various devotional passages were typically recorded in Latin, with the inclusion of any vernacular tongue being a relative rarity. As these texts were often the central objects in a lay follower's personal piety, they were highly prized possessions. Among the upper classes, this meant that they were often sumptuously decorated with jewels, gold-leaf, hand-painted illustrations, and (less frequently) with portraits of their owners. Even the less affluent would often save up their minimal earnings in order to purchase their own copies of the texts, though necessity often forced them to opt for inexpensive, block-printed editions. The ubiquity of these Books of Hours among fourteenth, fifteenth and sixteenth century Christians has made them the most common type of surviving Medieval illuminated manuscript. "… the Primer [or, more properly, its monastic antecedent] was constituted out of certain devotional accretions to the Divine Office itself which were invented first by the piety of individuals for the use of monks in their monasteries, but which gradually spread and came to be regarded as an obligatory supplement to the office of the day. Of these accretions the Fifteen Psalms and the Seven Psalms were the earliest in point of time to establish themselves generally and permanently. Their adoption as part of the daily round of monastic devotion was probably largely due to the influence of St. Benedict of Aniane at the beginning of the ninth century. The "Vigiliae Mortuorum," or Office for the Dead, was the next accretion to be generally received. Of the cursus or Little Office of the Blessed Virgin we hear nothing until the time of Bernerius of Verdun (c. 960) and of St. Udalric of Augsburg (c. 97l); but this form of devotion to Our Lady spread rapidly. … In these provision was probably made only for the private recitation of the Office of the Blessed Virgin, but after the ardent encouragement given to this form of devotion by St. Peter Damian in the middle of the tenth century many monastic orders adopted it or retained it in preference to some other devotional offices, e.g., those of All Saints and of the Blessed Trinity, which had found favour a little earlier." With this gradual modification of monastic religious practice came an eventual adoption by the laity, who viewed their ecclesiastical counterparts as spiritual exemplars par excellence. This ritualized means of dedicating one's life to God soon swept into the mainstream in upper class Europe, with a popularity that could be attributed to a number of related factors, including the lay instruction provided by the fraternal orders, the religious reforms of the Fourth Lateran Council, the idle hours experienced by the aristocracy (especially affluent noblewomen), and the mortal fear inculcated by the Black Death (and other epidemics). In this religious climate, "[g]rowing numbers were interested in the pursuit of a serious interior religious life, enough of them literate to create a market for religious books designed to cater for their needs. Books of Hours were the most important manifestation of this expanding devotional literacy." Given the exorbitant costs associated with hand-copied texts, this devotional path (and the prayer texts undergirding it) were originally only available to the royalty, the nobility, and the rich who could afford to purchase a personal Book of Hours. This cachet, based as it was on both spiritual and pecuniary exaltation, caused these texts to be revered by their owners as personal treasures. In subsequent years, the ubiquity of these texts among the upper classes eventually made them accessible to the more moneyed members of the merchant classes, a gradual democratization that was completed with the advent of modern printing. Indeed, the proprietary access to sanctity that was initially promised by the Book of Hours was abruptly quashed in the fifteenth century, when advances in printing technology placed affordable editions of the texts within the financial means of commoners and servants. At the same time, this general availability, coupled with the religious ferment that enveloped Europe for the next several centuries, combined to remove the Book of Hours from its place of primacy in personal spirituality, allowing it to gradually be eclipsed by various other prayer books (both Catholic and Protestant). The influence of these texts can still be seen, albeit obliquely, in the etymology and definition of the word "primer." Though today used to denote any variety of instructional text, it was originally the British term for the Books of Hours. The modern definition, with its educational connotations, arose due to the fact that the majority of literate individuals during the Middle Ages learned to read by following the daily devotions required by the calendrical text. The Litany of Saints—a reverential prayer dedicated to various martyrs, theologians, and Christian worthies. While most Books of Hours began with these basic contents, they were often expanded with a variety of additional prayers and devotions. The Marian prayers Obsecro te ("I beseech thee") and O Intemerata ("O undefiled one") were frequently added, as were devotions for use at Mass, and meditations on the Passion of Christ. In addition to these orthodox, religious contents, many lay devotees also used their Books for less overtly spiritual ends. The majority of surviving texts contain notes and marginalia, whose contents run the gamut from personal prayers and composition homework, to shopping lists and autographs. Some of this material we should be inclined to call 'secular', like the jottings on the triumphs of Henry VII which Anne Withypole added to the calendar of her printed Book of Hours now in the Bodleian Library, or, more mundanely, Mary Everard's notes on bed-linen and blankets in the Lewkener Hours, or the notes on debts and rents due and payments made which occur on the flyleaves of many Books of Hours, possibly reflecting the fact that they were sometimes used instead of Gospel books for swearing solemn oaths and obligations. Much of this sort of additional material relates to family matters, the records of births, deaths and, less often, marriages. But it is probably a mistake to think of such entries as purely secular. They found their way into calendars in the first place primarily in the form of obits, often no more than a bare note of the name and date of decease, but which might be more personal, like the note made against November 27th in the calendar of one such book, which simply says, 'my moder departed to God'. Such entries were not a matter of simple nmemonics. They were a call to prayer, a reminder of the obligation to intercede for the repose of the soul of the person commemorated. Moreover, the prized nature of these texts often led to their personalization through the inclusion of decorations, painted portraits, and prayers specifically composed for their owners or adapted to their tastes or genders. To this end, one common method used by scribes was to ink their customer's name into any suitable prayers, which turned the finished tome into a concrete relic of their piety. 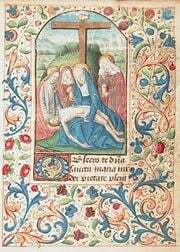 The prayer Obsecro te illustrated by a miniature of the Pieta, from the Book of Hours of Angers, 1470s. As many Books of Hours are richly illuminated, they form an important record of life in the 14th, 15th and 16th centuries, as well as preserving many tropes from the iconography of late medieval Christianity. In addition to the artistry of these images, some of these texts also featured more ostentatious decorations in the form of jeweled covers, portraits, heraldic emblems, textual illuminations and marginal decorations. The financial outlay required to obtain one of these texts made them important status symbols in noble society. This made them ideal objects to bequeath to loved ones, as they possessed spiritual, financial, and emotional worth. Indeed, they were often passed along as gifts (or inheritances) to favored children, friends and servants, and were even used as signs of dynastic allegiances. Eventually, this era of sumptuous overproduction came to an end, as the conclusion of the 15th century saw printers producing Books of Hours with woodcut illustrations. Using this technique, stationers could mass-produce manuscript books on vellum with only plain artwork and later "personalize" them with equally mass-produced sets of illustrations from local printers. Regardless of the specifics of their production, the Books of Hours were central to much of the era's personal piety. As a result, their physical format tended to reflect this fact, with the majority of the tomes constructed with the concerns of portability in mind—to this end, some were actually bound as girdle books for portability and ease of use. While [the artists] were given increasing scope to express their talents in elaborate and innovative full-page paintings, both books indicate that they were required to adhere to the instructions of an advisor, who was responsible for the selection of the texts and for the overall plan of their illustration. Various changes to the lay-out of the pages in the course of production reveal that the artists also worked closely with the scribe. The Rothschild Prayerbook was scrivened ca. 1505 and is only three and a half inches thick. Louis Nathaniel von Rothschild owned it but Nazis confiscated the text immediately after the German annexation of Austria in March 1938, purloining it from members of the Viennese branch of the Mayer Amschel Rothschild family. Through the efforts of Bettina Looram-Rothschild, the niece and heir of the owner, the government of Austria returned the book and other works of art to her in 1999. It was sold for Ms Looram-Rothschild by Christie's auction house of London on July 8, 1999 for £8,580,000 ($13,400,000), a world auction record price for an illuminated manuscript. The Connolly Book of Hours, was produced during the fifteenth century and is an excellent example of a manuscript Book of Hours produced for a non-aristocratic patron. It is of most interest to scholars for the in-depth analysis that it received at the hands of Timothy M. Sullivan and Rebecca M. Valette, who documented and contextualized all its illuminated leaves in their book Reflections on the Connolly Book of Hours (1999). ↑ The English term ("primer") is attested to in the Oxford English Dictionary, which states: "The medieval Primarium or Primer was mainly a copy, or (in English) a translation of different parts of the Breviary and Manual. 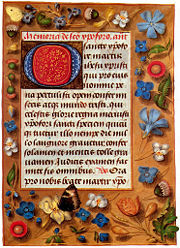 In the fourteenth and fifteenth centuries, in its simplest form, it contained the Hours of the Blessed Virgin (the essential element), the 7 Penitential and 15 Gradual Psalms, the "Litany," the Office for the Dead (Placebo and Dirige), and the Commendations; to which however various additions were often made. Early 16th cent. printed editions of these medieval works were freq. given the name Prymer on the title page. … After 1600 the word gradually lost these religious meanings, although in 17th-cent. England it continued to be used to denote a Roman Catholic prayer book translated into the vernacular" (2007). See also: the entry in the Online Etymology Dictionary. ↑ "Book of Hours" The Oxford Dictionary of Art. Retrieved 18 October 2007. .
↑ Those hours that are listed above in italics were required observances marked by a mass, while those that are not were optional and were celebrated privately. See Fernand Cabrol, the Catholic Encyclopedia "Breviary" for more details. This Roman Catholic website also features a helpful chart. www.fisheaters.com. retrieved October 20, 2007. ↑ Thurston, "The Primer," (1911). The particulars of these accretions will be discussed below. ↑ See also Eamon Duffy. "A Very Personal Possession." History Today 56 (11) (November 2006): 12-13. ↑ As Duffy notes: "By the early thirteenth century, England and the whole of Western Europe was in the full flood of the great expansion of religious provision for lay people associated with the Fourth Lateran Council (1215), and the popular Christianity of the friars. Devout lay people, especially among the leisured and well-heeled, and perhaps especially among wealthy women, were responding to the heightened mood of religious seriousness." Duffy (2006), 13-14. ↑ Thurston, ""Prayer Books" and "The Primer" (1911). Duffy (2005), 211-213. ↑ See the "Primer" entries in the Oxford English Dictionary and the Online Etymology Dictionary. ↑ Thurston, ""Prayer Books" and "The Primer" (1911). ↑ Leslie A. Toke, St. L. "Little Office of Our Lady." Catholic Encyclopedia. The Catholic Encyclopedia, eleventh ed. (New York: Robert Appleton Company, 1910). ↑ Thurston, "The Primer" (1911). ↑ Duffy (2006), passim. Thurston, "The Primer," 1910. ↑ Described in Andrea G. Pearson's "Personal Worship, Gender, and the Devotional Portrait Diptych," Sixteenth Century Journal 31:1 (Spring 2000). Special Edition: Gender in Early Modern Europe. 99-122. 121. ↑ Michael Camille describes it as the "most famous illuminated manuscript in the world." The "Très Riches Heures": An Illuminated Manuscript in the Age of Mechanical Reproduction.Critical Inquiry 17 (1) (Autumn 1990): 72-73. ↑ Margaret M. Manion, "Psalter Illustration in the Très Riches Heures of Jean de Berry." Gesta 34 (2) 1995, 147. Camille, Michael. "The "Très Riches Heures": An Illuminated Manuscript in the Age of Mechanical Reproduction." Critical Inquiry 17(1) (Autumn 1990): 72-107. Chilvers, Ian (ed). The Oxford Dictionary of Art. Oxford: Oxford University Press, 2004. ISBN 0198604769. Duffy, Eamon. "A Very Personal Possession." History Today 56(11) (November 2006): 12-18. 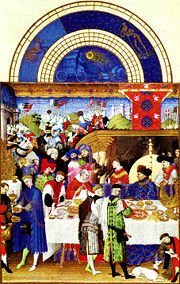 Manion, Margaret M. "Psalter Illustration in the Très Riches Heures of Jean de Berry." Gesta 34(2) (1995): 147-161. Thurston, Herbert. "Prayer Books." Catholic Encyclopedia. New York: Robert Appleton Company, 1911. Thurston, Herbert. "The Primer." Catholic Encyclopedia. New York: Robert Appleton Company, 1911. Toke, Leslie A. St. L. "Little Office of Our Lady." Catholic Encyclopedia. New York: Robert Appleton Company, 1910. Book of Hours (Ms. Library of Congress. Rosenwald ms. 10) From the Rare Book and Special Collections Division of the Library of Congress. History of "Book of Hours"
This page was last modified on 16 June 2016, at 15:17.